One size does not fit all: George "Jorge" Bell became a free agent after the 1990 season. The slugger had spent his entire career in Toronto, smashing home runs and selling Soul Glo out of the trunk of his car, but he felt the time was right to play in the U.S., and in the National League. 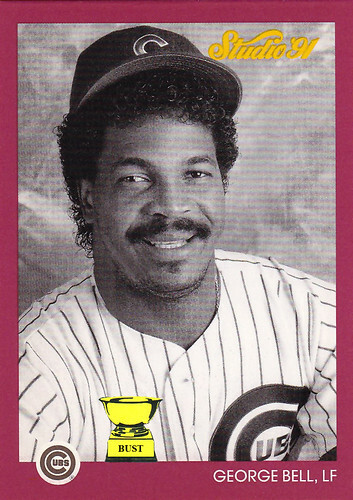 The Chicago Cubs offered him an impressive deal, and Bell was on board. Unfortunately for him, he did not read the fine print of his contract, which stated that he must wear a size 5 1/2 hat all season. Bell's Jheri curl fro spent the first half of the year bursting forth from the tiny cap, and the hat itself fell off whenever he made any sudden movements. Bell eventually gave up and just painted a large, red "C" on the front of his hairdo; the small hat was eaten by a goat.